"How do you tell the difference between a violin and a fiddle?" 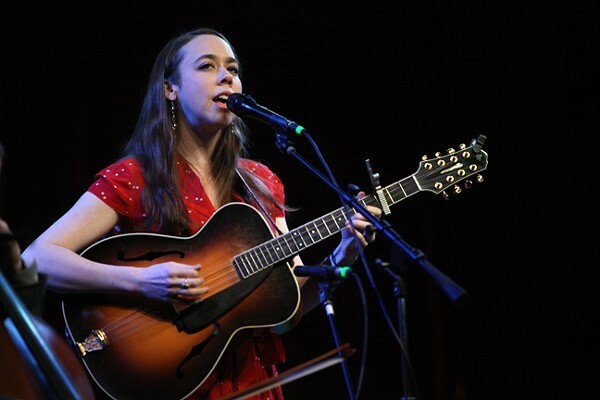 Sarah Jarosz primed the packed and appreciative Neighborhood Theatre crowd. "You don't spill beer on a violin." Such gentle good humor was indicative of the energy exchange between audience and Jarosz plus her empathetic onstage collaborators, Alex Hargreaves (fiddle) and Nathaniel Smith (cello). The vibe fused warm familiarity with focused instrumental firepower, Jarosz's no frills approachability with the trio's air of transcendental magic. 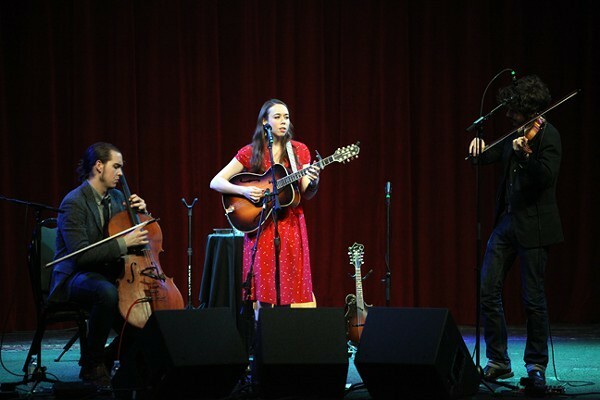 With little fanfare, Jarosz trouped onstage earlier in the evening in red dress and cowboy boots. The trio, which forms the musical spine of her latest album, Build Me Up From Bones, launched into the moody cyclical sea shanty Annabelle Lee. 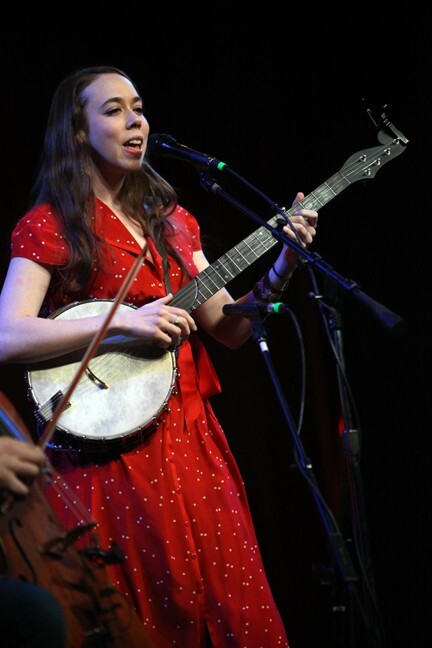 As Jarosz anchored the county-tinged lament with percussive banjo, Hargreaves' fiddle screeched and swooped smoothly like a hawk, entwining with, and then releasing Smith's richly lowing cello. The playing throughout the set was telepathic, which each instrumental turn spilling easily into the other. Yet there was never the sense that Jarosz's spidery runs on guitar, banjo and octave mandolin, Smith's sawing or plangent finger-plucked cello, or Hargreaves' Stephane Grappelli-flavored fiddle were showboating or hogging the spotlight. There was plenty room for play, but the trio's virtuosic round robin of newgrass-flavored solos were kept in check by the needs of Jarosz's songs. Those songs were a revelation. Jarosz's compositions fused lilting country, darkly roiling Appalachian currents, the dusky Americana of Gillian Welch and the sophisticated '70s jazz pop of Joni Mitchell into shape-shifting, deceptively fluid journeys. There was a classicism to Jarosz's unusually structured songs - bridges and verses are every bit as captivating and vital as the choruses - that recalled Linda Ronstadt at her peak. Indeed Jarosz's vocals, rangy yet never histrionic, harkened to each of these icons. Jarosz enveloped Welch's bittersweet-and-low alto, Mitchell's experimentation and Ronstadt's emotive power into a style uniquely her own. Highlights included the spiraling Celtic knot of stomping John Hartford cover "Squirrel Hunter," a plain-spoken yet gorgeous rendition of Cat Stevens' "The Wind," a spare 3a.m. juke joint take on Bob Dylan's "Simple Twist of Fate," and a pulsing, vertiginous run through of Radiohead's "The Tourist" which exerted a haunting tidal pull on the enraptured audience. The instrumental "Old Smitty" highlighted Jarosz's quicksilver fretboard runs on acoustic guitar in a rollicking tune that coupled freewheeling folk and the intricate contrapuntal lines of prog rockers like King Crimson. That last ditty prompted a shout out from the crowd, "Pretty good!" "What do you mean, just pretty good?" joked Jarosz. Yet, it was Jarosz's originals - urgent, haunting and hypnotic - that beguiled the audience. Hargreaves' chiming guitar and Jorosz's dulcet mandolin captured the suppleness of Bare Trees-era Fleetwood Mac and the spectral fragility of Crosby, Still and Nash on "Mile on the Moon." Jarosz's whirlpooling guitar figure merged with Hargreaves' cyclical dust devils on fiddle for the pensive and stunning "Build Me Up From Bones." Galloping banjo and sawing cinematic cello powered the widescreen cantering juggernaut "Fuel the Fire." After that barn burning set closer, an encore featuring a sweetly soaring take on Dylan's "Ring Them Bells" was almost anticlimactic. Much has been made of Jarosz's youth - she's not quite 23 - but on Friday night her instrumental prowess carried no hint of precociousness. Indeed her maturity and the affectionate, respectful bond she shared with Smith and Hargreaves added much to the comfort she shared with her audience. Her humility only accentuated the exhilaration that her playing and songwriting inspired. If the Neighborhood crowd was impressed with Jarosz, it was an admiration she and her fellow players had earned - through dedication, searching intelligence and casual brilliance.